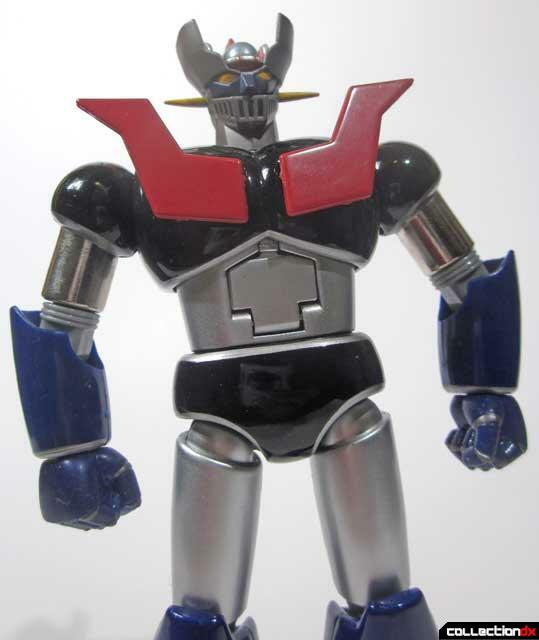 What would you say if I told you one could get a beautiful made, well sized, nearly all diecast Mazinger Z, with some slight sizing issues and perhaps one defect for around $20.00? 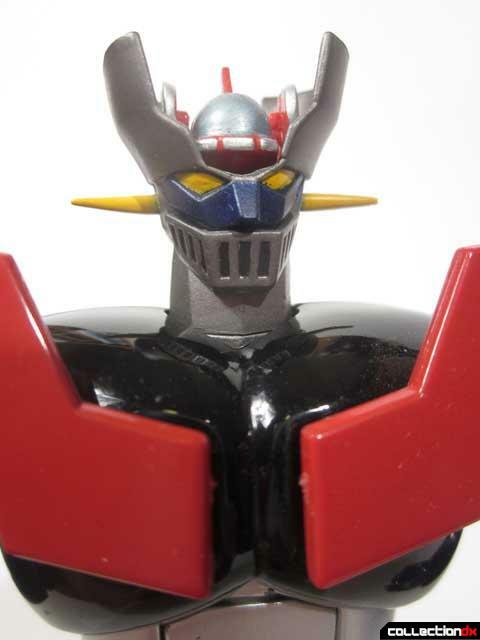 Back in 2003 during the early days of CollectionDX, JoshB reviewed the classic 1997 Soul Of Chogokin Mazinger Z GX-01 when it was relatively new on the market. In 2012, I would like to revisit this classic Chogokin with an updated review and a little background on what this Mazinger means to me. The 1990’s are my anime sabbatical years. Besides a few model kits, I did not purchase much in the way of anime related items. I was more focusing on my power pop group, record recollecting and the most important center of my life at the time: College. But if there was one anime item I felt like I absolutely needed to own it was when I found out about this new line of die-cast metal figures called Soul of Chogokin. I have no clue how I found out about these in 1997 in the pre internet days but somehow I knew about them. Maybe it was in the air calling me. Like many of our CDX members, who are in college as of this writing, I did not have any extra money to spend on a $65+ toy. Heck, I could barely afford food and gas. It was really a low point in my life seeing all these great toys released and I could not afford them. 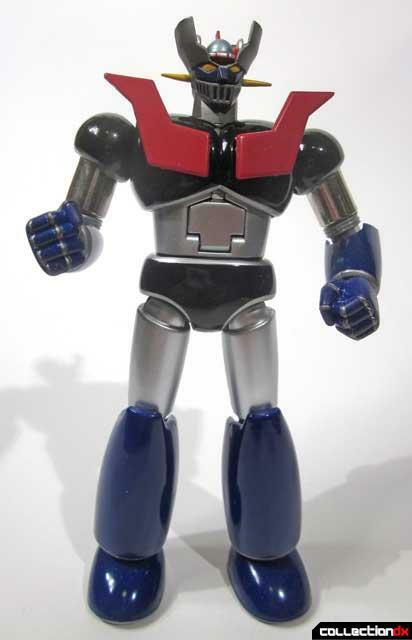 But I had to have that Mazinger. Flash forward to 2009. I had since graduated and I was hired at a really cool job getting paid quite well. My college education, that had the best of me for so long, had finally paid off. But something that I had put off for so many years was beginning to call me again. 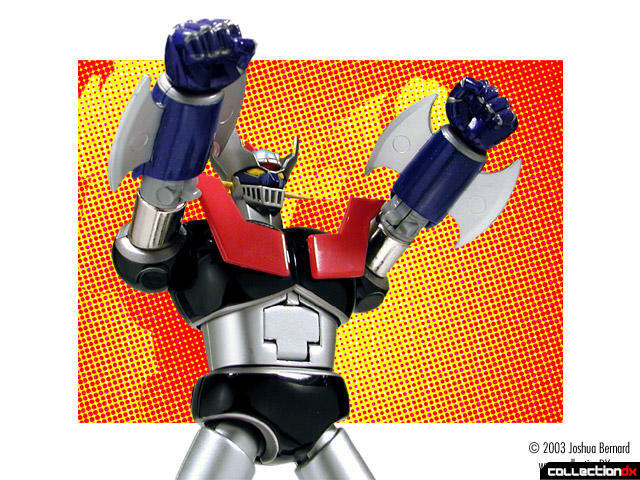 I wanted the Soul of Chogokin that I had love at first sight with: Mazinger Z GX-01. 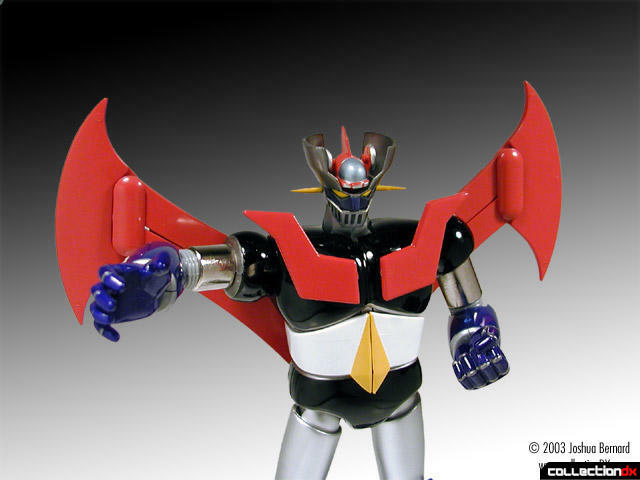 Yes I know they upgraded the Mazinger Z with GX-01R renewal but that was not the one I lusted after back in 1997. 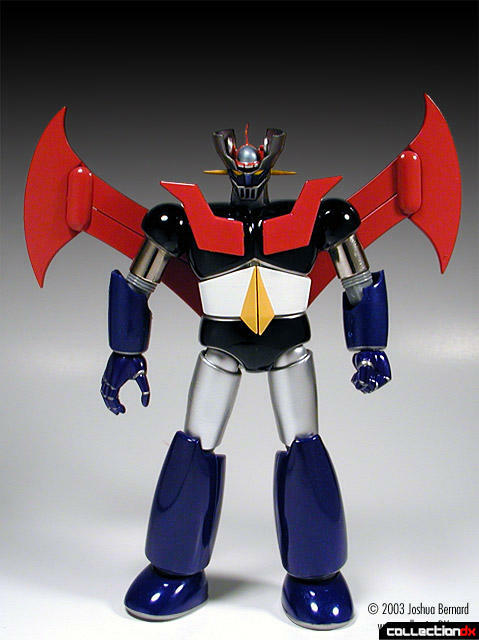 A few years later Bandai corrected some scaling and engineering issues with the original Mazinger Z GX-01 with an updated version called Mazinger GX-01R. Collectors promptly sold off their GX-01 and upgraded the GX-01R. Because GX-01 was a huge seller, and people more or less prefer the GX-01R, there are still many GX-01’s on the market and bargain prices. 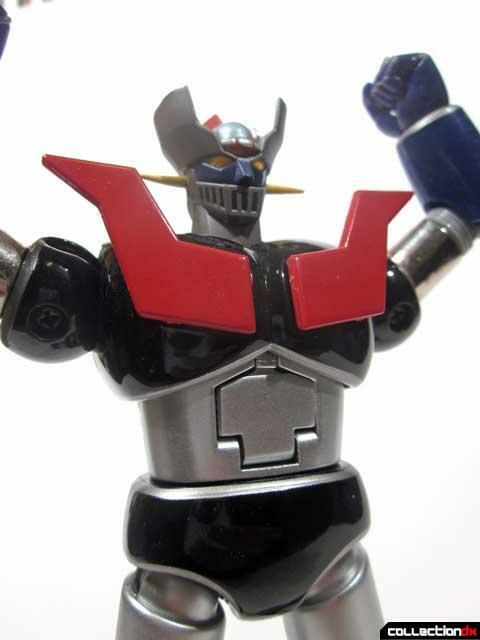 After many years, I finally bought myself a used Mazinger Z GX-01 in 2009 for $20.00, less that half the price when it came out in 1997. 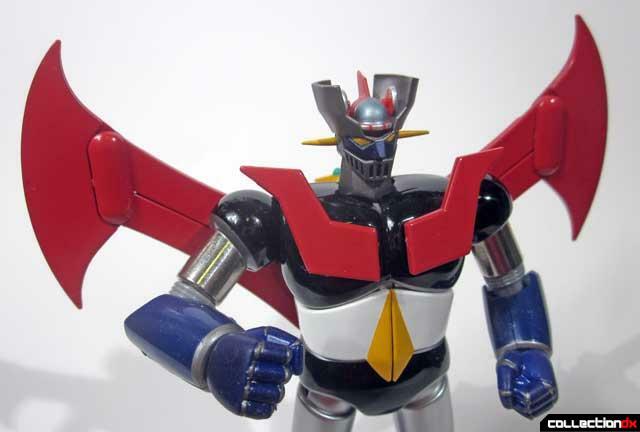 In 2011, with over 50 Soul Of Chogokin releases, how does the original GX-01 Mazinger Z still hold up? I bought my Mazinger Z used so many of the parts were already pre built for me but a few months later I purchased an NOS GX-01B Mazinger Z Black and I was able to get a good feel for how the parts assembled. Upon opening the box I was greeted with my Mazinger Z in a nice Styrofoam tray. Also included was a white box with plastic sprue, a vacuform tray full of various parts, a black stand base, an instruction sheet and placement stickers. The jet pack needs to be assembled as it comes as a kit, which is easily snapped together. Once assembled it easily fits around Mazinger and holds tightly. There is also a ratchet motion where you can change the angle of the wings from swept back to swung forward. The most maddening flaw is how the red flashes on the front seem to keep falling off as they don't hold over time. The Mazinger figure itself is heavy nearly completely made with die cast throughout. Articulation is also well done, as one is able to make all those Mazinger poses he was known for in the classic anime. 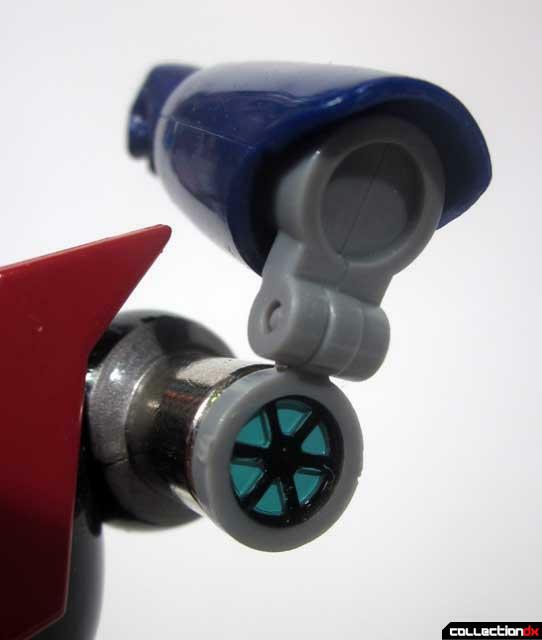 A fun feature is the missile in the chest that pops out with a punch of a button on the back of the figure. 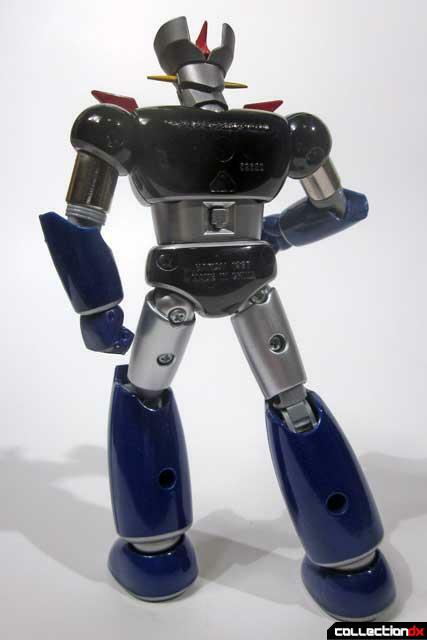 So what is the draw back of this first version of SOC’s Mazinger Z? First off it appears Bandai had not settled on a scale when they started producing these. The results were that as the other Chogokins were released Mazinger appeared shorter compared to the others especially the female Chogokins. Prebuilt parts would also be a feature of later SOC figures as to keep a GX-01 complete in the package the figure will be incomplete to display as the forward arms parts are on a sprue as well as many other parts. Most importantly there was a huge design flaw in the joint that connects the legs and body. The part, which connects the legs to the body, was over designed and could not hold the weight of all the heavy die cast parts. 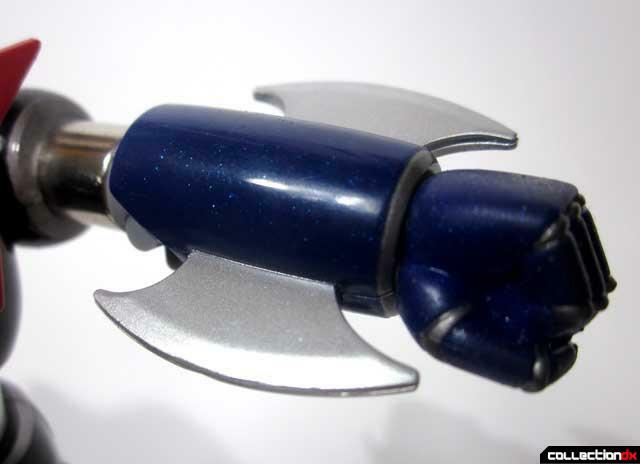 The part is made up of a fragile metal core with nylon plastic molded over the metal. The result is the part stress cracks throughout and simply disintegrates. 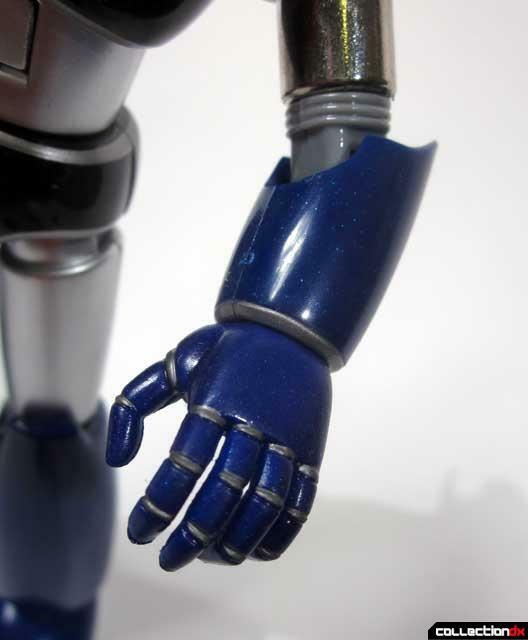 When I opened up the body of my Mazinger the nylon part was nearly falling apart and I simply applied glue throughout the part and filled up the stress cracks with glue. Finally the rubber is beginning to get a bit tacky on the GX-01. 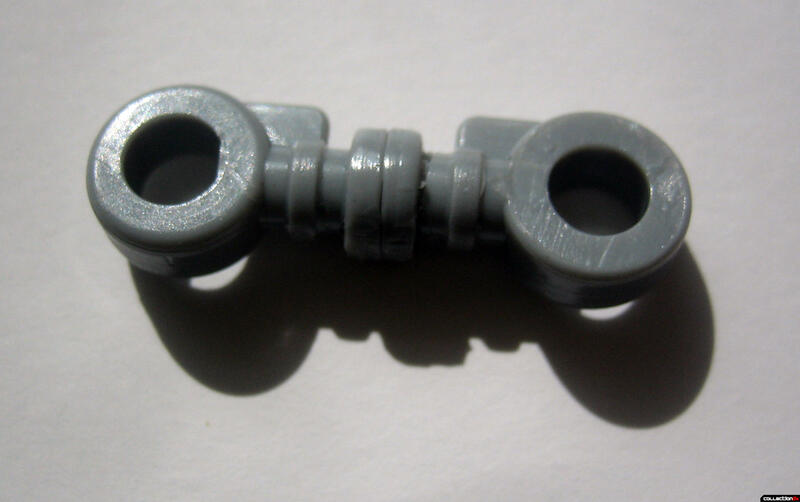 The rubber parts include the head and fists. There is really no way to stop it so make sure you inspect your GX-01 for the rubber parts and the legs parts before you purchase it. Overall I am satisfied with my GX-01. It was exciting to finally put closure on something that I have wanted for so long and overall I was not disappointed with my purchase and the feeling of finally owning the “Tranzor Z” of my youth is great. So the moral of this story is stay in college friends, it will eventually pay off so you can purchase the SOCs you always wanted but could not afford and perhaps at a better price. 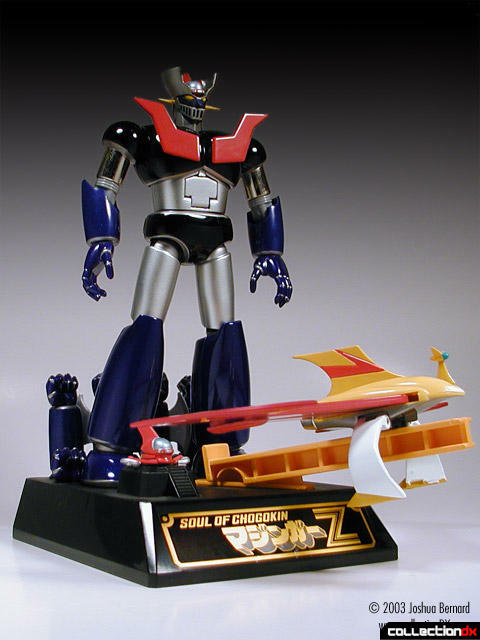 Mazinger Z is the first entry in the Soul of Chogokin line. Originally, the design was meant to be a part of the High Complete Model series (HCM), but Bandai took it to the next level and created this die cast masterpiece instead. 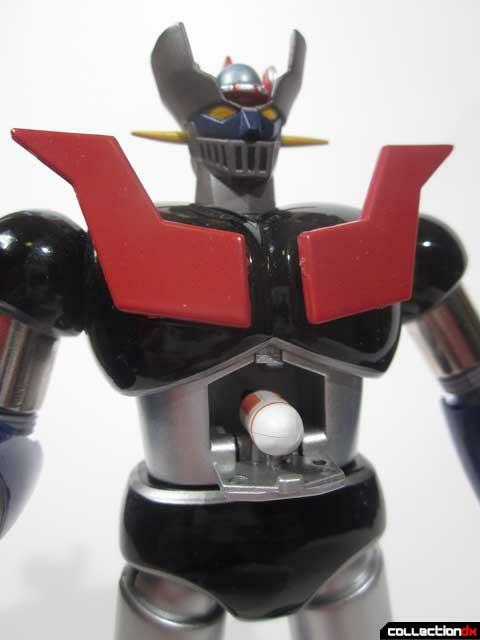 Mazinger Z is not without its flaws. The red emblems on his chest fall off, the upper legs are prone to cracking, and the spare hover Pilder does not stay on the base. Bandai addressed these concerns with it's bigger, badder GX-01R (The "R" stands for renewal). I have a similar story since i share your passion for Tranzor Z. I always saw pictures of both editions online but it was only when i went on a trip to Japan that i bought my very first SOC GX-01R. for about 50 bucks. The pictures on the back of the box sold me straight away, the proportions, darker variation of the blue paint apps and the more subtle rocket hatch in the stomach area were all great features. Looking back at it now and comparing it to the original release, i have no regrets. It should also be noted that, while it's good to wait and save money. some pieces tend to get even more expensive the more rare they become. The GX-01 you bought was used, some collectors including myself are always on the lookout for rare items that are still new or in mint condition, and those can be hard to find at a decent price the more farther away from their original release date they become. 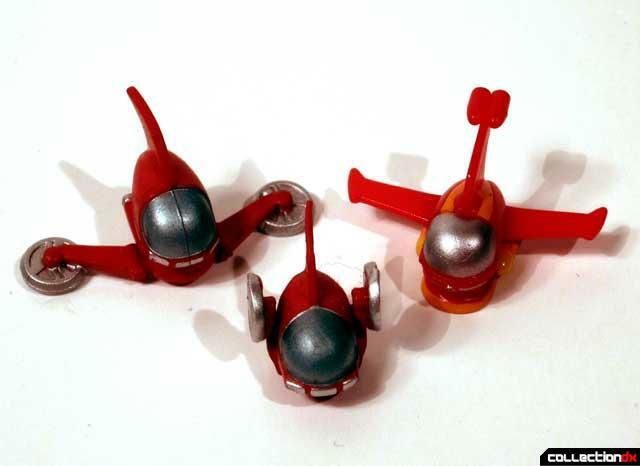 Oh, a correction to the review, the GX-01 does not come with three Pilders, only the Hover Pilder (normal & Wings up). 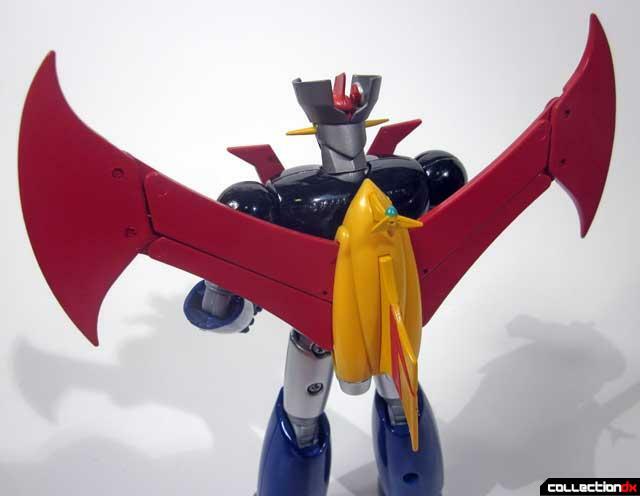 The Jet Pilder came with the GX-02 Great Mazinger. Somehow you got a Jet Pilder with your GX-01, but it was probably because the previous owner forgot that the Jet Pilder was actually a GX-02 accessory instead. His loss, your gain! Mazinkaizerm and the Mazinger Z, Yes when GX-01R to GX-01 there is no comparison, the R version is superior in every way. As you can read by my review this is more of a nostalgia review of something I personally wanted since I was in college in the 1990's but I couldn't afford and not to say that it is better than the later versions. But I also wanted to point out if this wasn't a SOC and just some $20-$30 generic Mazinger Z toy, would it still be a bad toy? In light of the later releases yes, but as a inexpensive die cast Mazinger is certainly not bad at all. 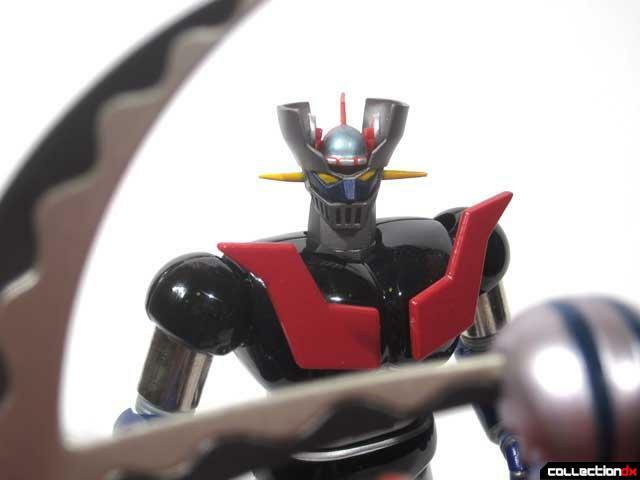 I do have great nostalgia for this GX-01 Mazinger for the reasons stated in the review. Going back to my GI Joes I've been reviewing, certainly the swivel arm Joes were superior to the straight arm figures of 1982 but there is something that attracts me to those 1982 straight arm figures that still grabs me all these years later. in 2017 GX-01 will be a 20 year old toy and it asks the question when does a toy start being "vintage" or "Classic" regardless of what flaws it had? I chose to write this review under the spotlight of GX-01 now becoming a vintage toy. Thanks for the heads up on the extra Pilder! I thought it was kind of odd that mine came with three~! Thank you for your thoughts and comments! Nice review... I am glad this guy and the 01R are a lot cheaper nowadays. It gives even more folks an opportunity to see some real modern masterpieces of toy design. I would love to see more of these for the stuff that were covered in the old, original CDX review-style. Years and time spent with a toy give you a perspective very different than when they first came out. I always welcome "ver 2.0" of the reviews here. Thanks for a great review with a personal touch. I always love the reviews that have a little "personal history" to them. It makes it special for the long-time guys like me. Cheers.